It’s blooming tea time again! Teasenz was generous enough to include two different blooming tea samples for our review. We’ve already covered their delightful Oriental Beauty Blooming Tea here. Today, we turn the spotlight to Love At First Sight Blooming Tea. This bouquet of green tea and flowers sounds similar to Oriental Beauty in terms of ingredients. So, will the infusion also taste similar? Let’s bring out the glass teapot and find out. 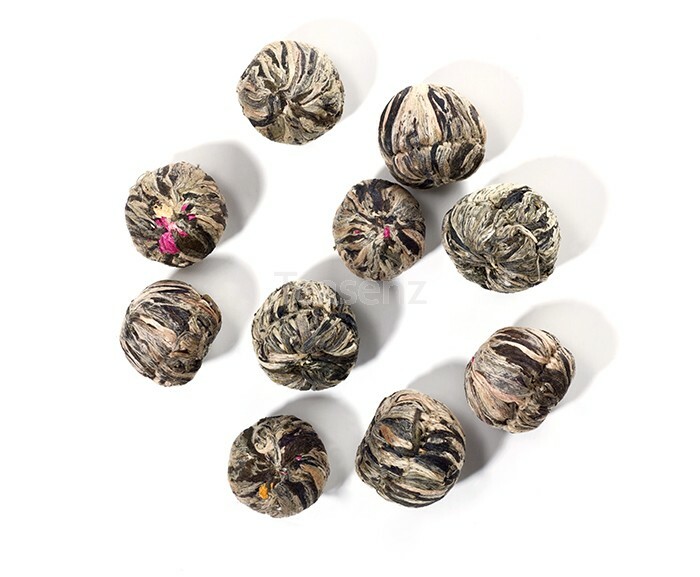 Steeping Instructions: Use 1 blooming tea ball for every 8 oz of water. Heat water to boiling (212 degrees Fahrenheit / 100 degrees Celsius) and steep for 3 to 4 minutes. In its dry form, Love At First Sight could almost be mistaken for Oriental Beauty. The shaped ball is the same size, as large as a quarter or a grape tomato. It’s also silk-soft to the touch and features the same colors (dark green, silver, and white, with bits of bright pink) as Oriental Beauty. Finally, its dry fragrance is so subtle that I have to hold the tea ball up to my nose to detect it. When I do, I inhale a slightly grassy green tea scent. The lack of a strong fragrance doesn’t worry me, though. The other blooming tea I tried behaved the same way. So if Love At First Sight continues to act similarly, the true breadth of its profile will emerge after it’s been brewed. After boiling water in a stovetop-safe teapot, I steep Love At First Sight in boiling water for 4 minutes in a glass teapot, watching as the tea ball opens. And why not? That’s the novelty of blooming tea: Being able to watch this Chinese art form unfold itself like a spring flower blooming outdoors. Love At First Sight’s flower does differ from Oriental Beauty’s, by the way. Instead of one globe amaranth and an orange lily, Love At First Sight reveals two amaranths and a bright yellow calendula. However, my first cup of Love At First Sight still reminds me of Oriental Beauty. The pale golden-yellow liquid gives off an appealing floral fragrance. The first few sips confirm that impression; a delicate floral flavor coats my tongue like a veil. Gentle breezes of peach and apricot are laced with undercurrents of jasmine and the hay-like flavor of silver needle white tea. The latter surprises me, especially since silver needle isn’t listed as an ingredient. A light body and soft mouthfeel add to Love At First Sight’s refined nature. I was able to get three cups from one ball of Love At First Sight (all from one steeping, poured into separate cups). I didn’t taste much of a difference as the tea cooled down, but I did notice that Love At First Sight doesn’t carry as much character as Oriental Beauty. It’s more nuanced, and less sweet and layered. If I had to choose, I’d say that Oriental Beauty is my preference of the two blooming teas, but Love At First Sight is enjoyable in its own right. I don’t know if I love Teasenz’s Love At First Sight Blooming Tea, but I definitely like it. It’s an aesthetically pleasing tea, with a dainty garland of floral and fruit flavors and a final, unfurled miniature garden that takes my breath away. It’s more sophisticated than what I normally look for from a green or floral tea, but it’s still quite good. I’d drink it if more were available at home or if a friend served it. If you like delicate green, white, or floral teas and haven’t tried blooming teas yet, Love At First Sight might be your ideal “gateway” into that realm. Possible Book Pairings: One can’t drink this tea without thinking of fictional couples or torn-apart lovers who fit its namesake. Try Love At First Sight with Laini Taylor’s Daughter of Smoke and Bone Trilogy, Ailce Sebold’s The Lovely Bones, or the ultimate example – William Shakespeare’s Romeo and Juliet. 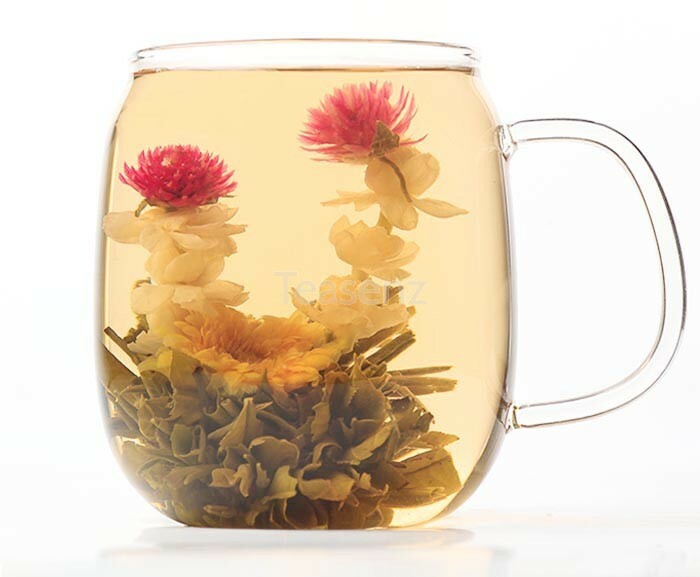 You can purchase Love At First Sight Blooming Tea directly from Teasenz here. A number of readers enjoyed learning about blooming tea when I first reviewed it for A Bibliophile’s Reverie. So, how about another one? 😉 Teasenz was kind enough to send two blooming tea samples; and today I offer my thoughts on the second sample, the delicate and refined Love At First Sight Blooming Tea. 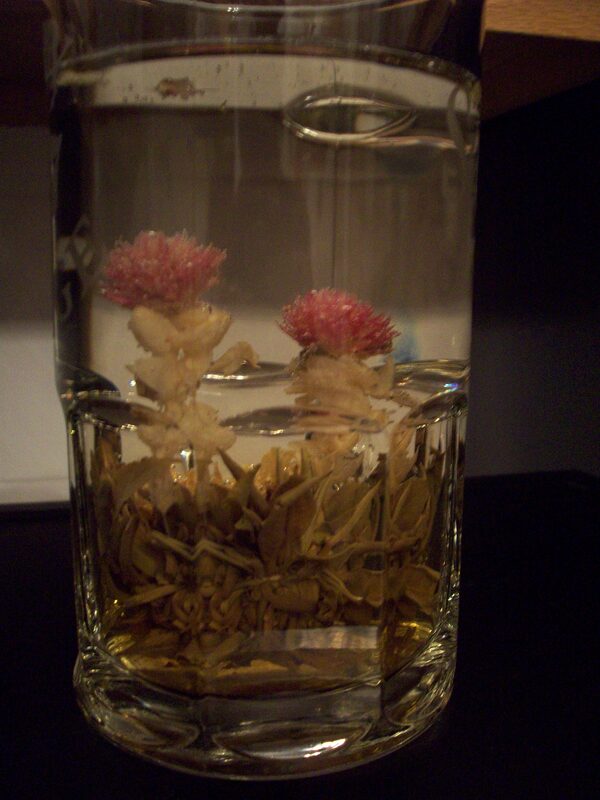 Blooming tea is so fun. 🙂 But unfortunately I’m not a huge fan of jasmine. 😦 Jasmine and lavender always remind me of massage parlors or chiropractor offices, so I don’t get a ‘fresh’ memory to associate with the smells, haha. But it is very beautiful! Awwwww. *lol* I personally love floral scents, especially jasmine. But everyone is different when it comes to preferred tastes, scents, etc. 😉 And the one thing I definitely know after trying both samples is that I’d like try more blooming tea in the future. The way this one blossoms is beautiful! Must try sometime.